The air quality index (AQI) is a nationwide standard method developed by the U.S. Environmental Protection Agency (EPA) for reporting daily air quality to the public in a health-related manner. It tells you how clean your air is, and what associated health concerns you should be aware of. The AQI describes ambient air quality concentration levels for sulfur dioxide, ozone, carbon monoxide, nitrogen dioxide, and particulate matter in terms of a concentration index for the highest pollutant level in a previous time period. The pollutant concentrations are measured and converted to numbers based on a mathematical formula that transforms ambient pollutant concentrations onto a scale where an AQI of 100 would be equal to the National Ambient Air Quality Standard. Pinellas County Air Quality - How's the Outdoor Air Today? 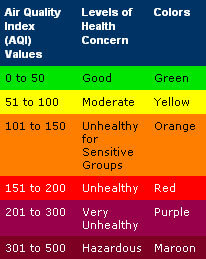 The Air Quality Index is forecasted daily at approximately 11 a.m. and updated as needed at approximately 4 p.m. The Friday forecast includes the forecasts for Saturday and Sunday. For additional information on Pinellas County Air Quality Index forecasts, please call 727-464-4422, Monday through Friday from 8 a.m. to 5 p.m., holidays excluded. 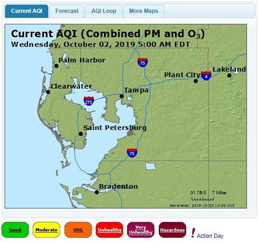 Air quality information for the Tampa Bay area may also be found in the weather sections of the Tampa Bay Times and USA Today. For information on the latest pollen counts in the Tampa area, visit the Asthma & Allergy Foundation of America, Florida Chapter .